Boston Celtics head coach Brad Stevens calls out from the bench during a game against the New Orleans Pelicans in New Orleans on March 18. In his first two seasons in the NBA, Boston Celtics guard Terry Rozier played sporadically during games, and sometimes not at all. To keep him sharp, coach Brad Stevens ordered Rozier and his end-of-the-bench compatriots to attend mandatory off-day workouts, where the reserves would run through drills and play three-on-three. It is not uncommon for NBA reserves to practice more than the starters and key role players who rack up big minutes. But what Rozier witnessed at his practice sessions was rare: Every time, Stevens would stay until the final shot had been taken, sometimes stepping into a game or drill himself. The head coach tended to the scrubs as if they were stars. Stevens’ treatment of Rozier informs the way the Celtics have thrived this season. In the face of constant injury, including the devastating losses of stars Gordon Hayward — who sustained a gruesome left ankle injury and a fractured tibia five minutes into the season — and Kyrie Irving, the Celtics still wrestled the No. 2 seed and a matchup with the seventh-seeded Milwaukee Bucks in the NBA playoffs. The series begins Sunday at 1 p.m. in Boston. The Celtics succeeded for many reasons — Stevens’ tactical acumen, Al Horford’s genius defensive movement, the stellar combination of 21-year-old Jaylen Brown and 20-year-old Jayson Tatum. 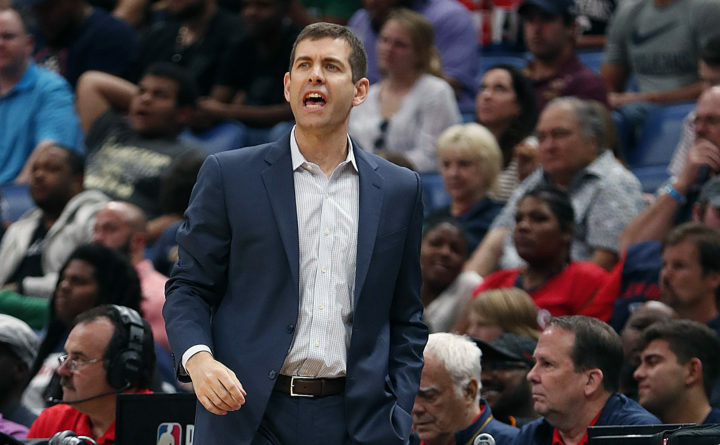 The most compelling cause behind the Celtics’ season might be the fundamental bedrock of how Stevens handles his program — he still refers to the Celtics as a program, a vestige from his days taking a Horizon League team to consecutive Final Fours as Butler’s wunderkind head coach. Those who know Stevens say he focuses to make every person in the program — from low-level assistants to equipment managers to Irving and Brown — feel valued and prepared. Rozier said Stevens treats him the same now that he’s starting and one of Boston’s top scorers as he did when Rozier was a rooking playing minor minutes. Stevens instructs assistants to coach every player at their position as if they’re going to play a prominent role not in some undetermined future, but the very next game. When the Celtics lost players, those who filled roles had already been groomed. The approach has allowed Stevens to manipulate his roster and overcome injuries that, for other teams, may have been insurmountable. The Celtics are 9-5 since Irving last played, despite several games that meant nothing in playoff seeding. They have employed 19 starting lineups, only three of them more than four times. The injuries didn’t stop at Hayward and Irving. Horford missed nine games. Marcus Smart, a defensive menace and part of Boston’s soul, missed 30 and remains sidelined. In the third game of the season, Stevens inserted Jabari Bird — a rookie who would appear in 13 games all season — in a crucial moment to defend J.J. Redick. The Celtics outscored the Sixers by 11 points in 13 minutes with Bird on the floor, and they won by 10. For an overhauled roster with only four players remaining from 2016-17, it served a lesson in Stevens’ approach. In the absence of Hayward and Irving, the Celtics have adjusted. Without Irving’s magnificent isolation game, the Celtics have further emphasized ball movement. Tatum and Brown have taken on more of a scoring role. Rozier has become one of the primary guards to initiate the offense. Back in October, when Hayward landed awkwardly and dislocated his ankle, Johnson felt heartbroken for Hayward, whom he had coached at Butler. His next thought was, “Brad’s gonna figure something out.” He remembered their first Final Four run, when Butler’s starting forward got into foul trouble in the Elite Eight and Stevens turned to freshman Andrew Smith, who had not played since December but still contributed solid minutes. Stevens had prepared him for the moment, and Johnson knew the Celtics would benefit from the same mentality.